Part two of my interview with Sterling Gates and Jamal Igle. Anj: I will be honest, I miss Alura. She was such a powerful, polarizing, and in many ways sympathetic character. I vacillated between hating her and feeling for her. Was she a tough character to write? And her death scene is so different from Zor-El’s, so quick and nearly silent. It’s just as powerful but in a different way. How did that scene evolve? Sterling Gates: Of all of the characters in New Krypton, I found Alura the easiest to write. She was a woman wrapped in a shroud of grief, always trying to do what was best for her people. She would always be hard on Kara, be a very tough mother, but then she would fiercely defend Kara if anyone said anything bad about her daughter. I loved that. I loved writing that. 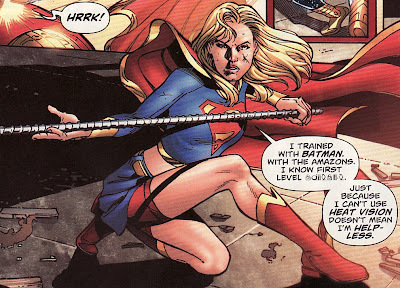 She had her ways, and they were ways that Supergirl didn’t always understand. One of the things I wanted to do in Supergirl is present a multitude of different female characters. Kara, Alura, Cat, Lois, Lana, Ma Kent, Lucy Lane, they’re all fascinating characters to me in their own rights, and I wanted to be sure I wrote them to the best of my abilities. Also, there are very few male characters in our run, and that was completely intentional. I wanted to show readers what I believe: women in the DCU are just as compelling as the men. If I were writing a different book, like Superman or whatever, I would’ve used a different tactic and writing style, and focused on different things. I just wanted to make sure all of the women in the Super-Universe were well represented in the book called Supergirl. It was important to me. 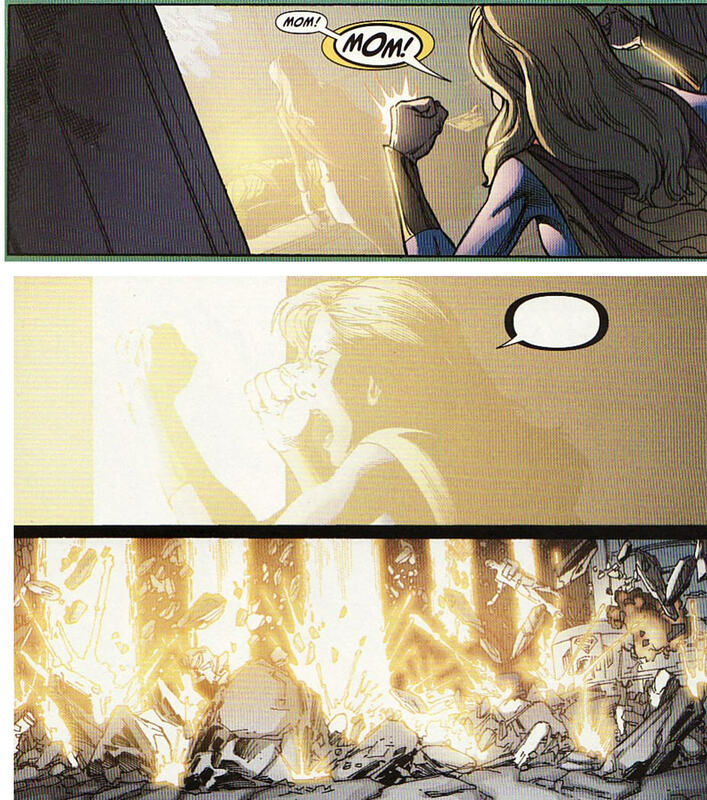 Alura’s quick death came out of necessity more than anything else. 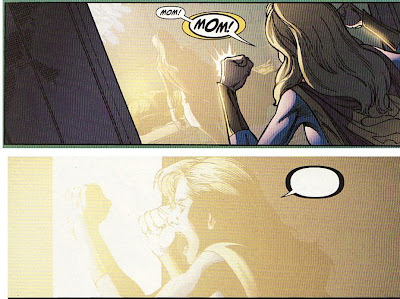 I’ve said this before, but I could’ve spent an entire issue dealing with Alura’s death. I wanted to. I wanted an entire issue of Supergirl to be Alura’s life flashing before her eyes -- kind of like what we did in Supergirl #47 -- as she tried to stop Reactron from exploding. Alas, we didn’t have the space or the time, so her death had to be as quick and meaningful as we could make it. Jamal drew the hell out of it, I thought. Anj: It's crazy to me that the Alura death scene, which worked so well for me because it was so brief, came about almost by accident. Serendipity at its best! SG: What’s that saying about adversity inspiring creativity? Those pages were truly co-written by James and I, by the way. He would write the top panel with Superman fighting Zod, Ursa, and Non, and I’d write the bottom four panels with Supergirl and Reactron and Alura. We worked very, very closely together across the entire War of the Superman, to the point where I have trouble remembering who wrote what in the end. Anj: One of my favorite characters you added to the book was Superwoman. Her being Lucy Lane has major implications in both Supergirl and Superman’s books. How was it decided to make Lucy Superwoman? Did you worry about any fan backlash? SG: New Krypton was meant to be a very personal conflict for all members of the Superman Family, and Geoff and James had already discussed Lucy being Superwoman by the time I started writing Supergirl. I loved the idea and ran with it. I didn’t worry about fan backlash, I worried about telling a big story that hung together and worked with Lucy as a character. Anj: Another great character from the run was Bizarro Supergirl. Was it as much fun to write and draw her as it seemed it was? SG: I love Bizarrogirl. She is a BLAST to write, and she has such a wonderfully creepy look to her, even when she’s doing something completely ludicrous. Jamal really made her look damn cool, as did Bernard Chang. Oh, and Amy Reeder! Amy made her terrifying. I liked Amy’s Bizarrogirl covers so much, I bought the original art for the Supergirl #56 cover from Amy so I could hang it in my office. Jamal Igle: Oh God, I had so much fun with her. It was hard trying to make her scary because she ends up being such a looney tunes character during the story. I had a great time with all of the Bizarro’s actually, I snuck Sterling into one panel, but the big secret is that one of the Bizarro’s is based on Geoff Johns as well. SG: Yeah, he’s the one in the “Detroit” hat, and me am the bald one! 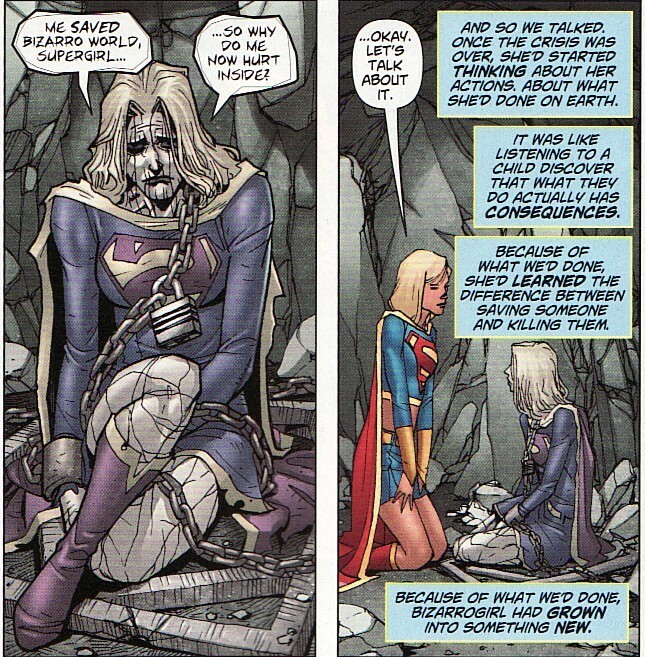 Anj: I really loved the whole Bizarrogirl arc as it was such a great way to explore what Supergirl was dealing with after the tragedy of War of the Supermen. How important was it for you to have Kara deal with those emotions and issues? And how great was it to use Bizarro Girl as foil/echo/sounding board for Supergirl? I loved their interplay. SG: Well, coming out of the War, I felt that we really needed to focus on what that event meant to Supergirl and what happened to her next. For all intents and purposes, she failed in her mission to be a hero. What did that mean? How do you overcome a failure of that magnitude, and what does that kind of thing do to a person, especially when they lose a parent in the process? So for me, that entire Bizarrogirl arc was about examining failure and post-traumatic stress disorder. That’s why she has the nightmares, that’s why she quit being Supergirl and went off on her own for six weeks. That’s why she quit. It was Bizarrogirl’s entrance, Superman’s absence from Metropolis, and big sister Lana’s “come to Jesus” speech that pushed her back into the game. And once she was there, she realized that she needed to get back into doing what she does: saving lives. I just didn’t want to have Kara shuffle all those emotions to one side and ignore them. That kind of thing can really destroy a real person, and I wanted her to work through those emotions as best they can. It made her more real for me. Now, you can debate how successful we were with it, but I think at the end of the day, the Bizarrogirl story is one of my favorite things I’ve written. Plus, it had Dr. Light acting as a huge orange orbital laser! So cool! Then it was important to me to give her a very light, fun story, which is why we went from the melancholy Bizarrogirl arc to the annual with the Legion. I was ready to see Supergirl smile again, and putting her in with the Legion felt like the right time and place for her to go next. Anj: And now the run has ended with Supergirl and Cat Grant coming to some accord and Kara happy with herself for the first time in a while. How far has she come since Supergirl #34, your first issue? Do you feel like you achieved what you wanted to with the character? SG: I think so, yes. That was what that last scene in Supergirl #59 was about. Kara steps back on Christmas Day to recognize she has family around her, that she’s not always going to make the right decisions, and that that is part of what makes her human. Kara now has a human identity that she can use to relax or study the people she’s living amongst, and she’s finally shown the person who took her to task the most (i.e. Cat) that she really can do worthwhile things. I think that’s an important message for teenagers -- no, scratch that. It’s an important message for everyone. If someone comes down on us, we shouldn’t just take it. We should do our best to prove them wrong. We should try to show them that we’re better than they assume we can be. No one else is going to change minds about you but you. And that’s what Kara learned while we were working on the book, and hopefully that’s something she’ll take with her going into the future. I’m incredibly excited to see what happens to her next. JI: I’d like to think so. I’d like to think that we brought Kara into a new place in the world. Anj: What do you think of the Supergirl fanbase? Some of the things you brought to the table (Linda Lang, bike shorts) weren’t exactly uniformly loved. Did you know there was such a passionate group when you signed on? SG: Sure. All characters have bigger and more passionate fanbases than we expect them to, but you can’t please every fan. The only people we can please are ourselves. If you’re a writer and you listen to people on the Internet and use their opinions or reviews to write your next book, you’re not writing that book to the best of your abilities. We set out to tell the Supergirl stories we wanted to tell in the way we wanted to tell them. I will be eternally grateful for everyone’s support, and I hope we put out books that people enjoyed. JI: Not initially but I certainly found out pretty quickly. The majority of the Supergirl fans have been awesome and supportive. The dissenters were rare and unfortunately seemed to be focused on the fact that we decided to give her a pair of shorts, (which actually weren’t supposed to be separate shorts but a skort ) and seemed to use that as they’re battering ram. I hold no ill will towards them, they’re entitled to their opinions, even if I don’t agree with them. Anj: Lastly, I am sad to see you guys moving on. You treated Supergirl with respect and made it okay to be a Kara fan again, taking her on the hero’s journey. So can you announce what projects are coming up for you both? JI: I’ll be taking over the penciling duties of Zatanna with issue #11 however I also drew a back up story in Zatanna # 9. Anj: Well I can't thank you guys enough for doing this interview and for your run on Supergirl. I believe it is going to stand the test of time and become a sort of benchmark for the character. I know that you have made a lot of fans here who are going to follow you to your next projects. I hope that at some point we get to see you guys on a Supergirl story again. I guess I'll be reading Zatanna from now on! And I'll be waiting to hear what you have coming up next Sterling! Thanks! Agreed. Thanks guys for everything! Continued success! Thank you again Anj for this insightful interview. It was a great way for Sterling Gates and Jamal Igle to give us Supergirl fans one last farewell. If DC was smart, they should ask your permission to reprint your interview when the last of the Gates/Igle run is collected in a trade paperback. Seriously. And thanks again, Anj. 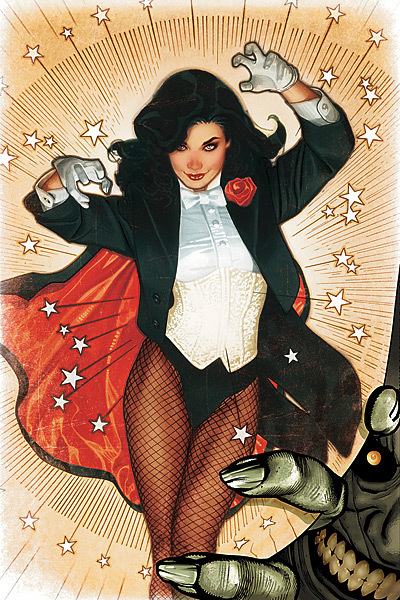 I hope you caught Jamal's spiffy art on this week's Zatanna #9. From Kara Zor-El to Zatanna Zatara - I like that. Can't wait for Sterling's announcement. Anything but another sodding Green Lantern book! Great interview!!! Thanks, Anj. Thanks, Jamal and Sterling!! I wish you'd come back to the book, perhaps some later date? One can hope. You did Kara/Supergirl good!! THANK YOU!! This was a great interview, nice work ANJ. Like you, I'll miss Alura. A deep, emotionally complex character, with a major connection to the lead, that I actually came to care about in such a short time. That's writing. Thanks again to both Jamal and Sterling for a fantastic extended run on this book. I know I'm not the only one that's going to be watching for future projects from both of you. Yeah looks like I'll have to start buying Zatanna for sure. These were both great interviews in every way, I haven't enjoyed a particular Supergirl run since the Empire Days of Steve Skeates and Bob Oksner. These guys just "get her"...and the notion that the Mighty Supergirl has an overbearing fussy withholding & slightly dim Mother, is one for the ages. I can see why Alura got killed off, it was a storytelling necessity and the consequence of her own bad leadership, but LORD she was a great character while she was here. Thanks again for that and the origin revamp and so much more. And thanks to Sterling Gates and Jamal Igle again for chatting with me and for visiting here over the last couple of years!